USANA, word! : We really experienced the vision! We really experienced the vision! You may have seen some of my posts about our ‘Experience the Vision’ June Roadshow with Tony and Tammy - they're all over Facebook! And it turns out I’m not the only one whose excited to see the brilliant Tony and Tammy Daum back on our shores! Our amiable guests Tony and Tammy Daum 2-star Diamond directors from Miami, Florida absolutely rocked last night’s Sydney Guest event with a crowd of 370 attendees hungry to share their motivation, knowledge and wise words of wisdom! Geoff Watt, General Manager of USANA Australia welcomed our guests with an opening speech to start the night off right. With masses of excitement in his voice, Geoff spoke about what was to come during the evening and brought the lovely couple up on stage to present their personal stories on why they chose USANA and how it has helped them grow and flourish. Personally – I believe it takes great courage to be open with people and present to a large crowd. After all, personal life situations (which not everyone likes to talk about) can be a pretty private matter. But Tony was happy to share his experiences! For example, his diagnosis of diabetes and financial struggles (it literally came to the we-are-broke point) only lead him to his now super successful mission. The determination to change his life and that of his young family’s not just for the short-term, but forever! The motivation flowed as we welcomed our NSW state RESET™ Challenge participant and successful weight-loser, Pete Turnbull! Showing off his wonderful achievement (Pete dropped a whopping 22kg! ), Pete looked fantastic and it was wonderful to share his uplifting story. A big congratulations Pete – very impressive! Meredith Quinlan, our USANA Sponsored Athlete and Ultra-runner shared an update on what she has been up to in her ultra-running world. She spoke about how using USANA products has helped manage her keep her up to speed as part of a healthy and active lifestyle. Wonderful insights from an amazing athlete! Our recognition segment was huge! We had a staggering 12 new Gold Directors, two new Ruby Directors and four new Diamond Directors to recognise and applaud! The stage was filled with wide smiles, amazing (and I mean AMAZING) bouquets of flowers, perfect pins and plaques on stage. Each person onstage had a sparkle in their eyes and a soul filled with joy – they created an ambiance like no other. The stage was truly packed with loads of energy and excitement. And talking of energy, almost half of the audience compised Gen-Ys - it was impossible not to be affected by their huge support and encouragement as they cheered and applauded their team members and leaders – I could definitely see where this was going, our USANA future Gen-Y diamonds were unquestionably in the room last night! Continuing from the lively energy in the room, Geoff returned onstage to introduce another major highlight to this spectacular evening. Geoff was holding a huge cheque for $25,000.00 (yes you read right!) 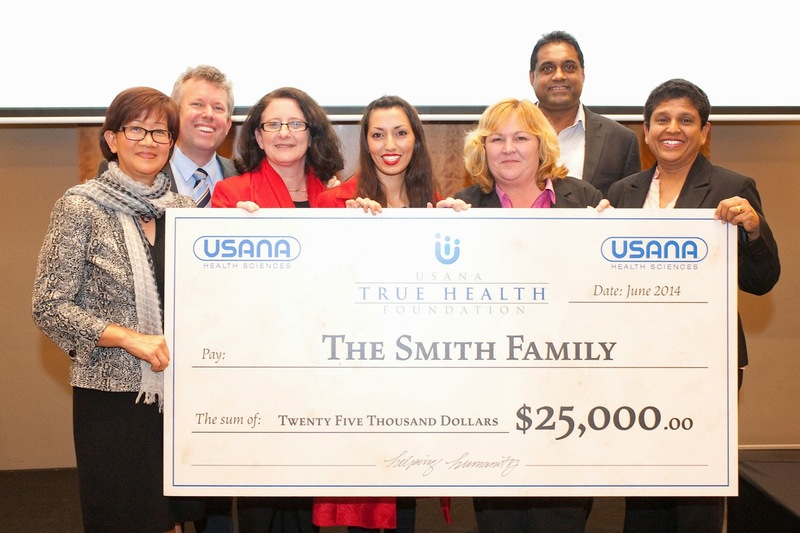 from our USANA True Health Foundation to The Smith Family! Seeing everyone’s faces light-up with delight as he presented the cheque to The Smith Family Corporate Partnership Manager, Michelle Hillman, was something I won’t ever forget! Plus, there was living proof that the Smith Family can lift young people out of the cycle of poverty and offer opportunity - in the form of another member of the Smith Family corporte team, Mya. Having been nurtured by the Smith Family system throughout her educational life, once she had completed her university education, Mya wanted to give back. So, she gained employment with the marvellous organisation that is the Smith Family. What a wonderful story! By donating to the True Health Foundation, whether as a one off, or through auto-order (which I highly encourage everyone to do! ), it was clear to see what an amazing difference we are making to people’s lives and the education of our future generations! A huge thank you on behalf of USANA for making this possible! As we all continue to donate, we are able to help the community and families to make a positive change and give hope. So, as we wrapped up for the Sydney Experience the Vision event! Tony and Tammy were looking forward to wowing more audiences and looking forward to returning to New Zealand once more. Thank you to Tony and Tammy Daum for spending the time and spreading your love for USANA with your wonderful insights - I wouldnt have missed it! I’m really looking forward to seeing more Facebook posts as our events continue to bring the power of our USANA family and our amazing invited guests together for more incredible events. What do you love about your USANA business? As always, keep us posted!